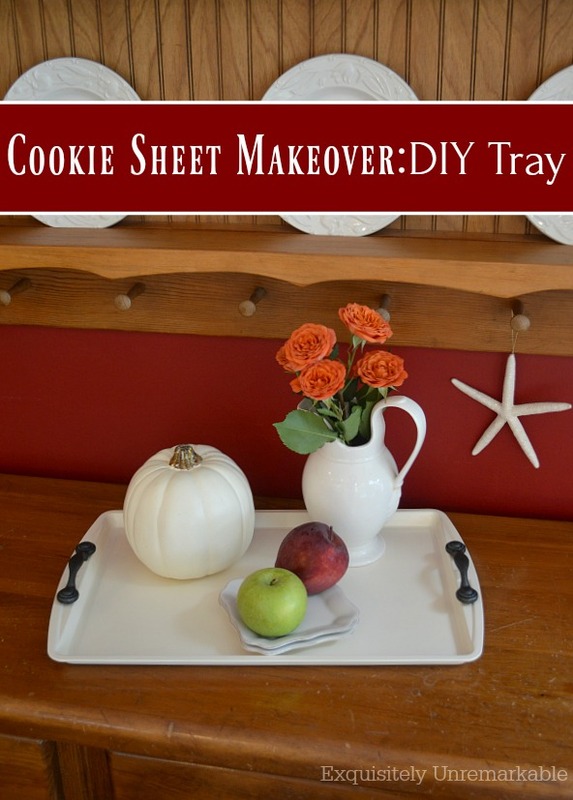 Turn an old cookie sheet into a brand new home decor accessory with a little paint. You may have heard me mention from time to time that I do not like to cook. Decorate the kitchen? Bring it on. Make food in it? Um...no. So it probably makes perfect sense that I don't own a lot of fancy kitchen tools or pots and pans. As a matter of fact, I pick up many of my supplies at the grocery store. Like my cookie sheets. Good Cook...which I'm certainly not. They're inexpensive, but get the job done and usually hold up nicely. Well, this weekend when I grabbed them to bake some cookies I took a good look at them and cringed. They were in awful shape and needed to go. Immediately. Buuut since I don't love throwing things away and often end up at the thrift store in search of items to makeover, I kept them and began brainstorming. I knew from the start that I wanted to make something useful, not just decorative, so I settled on a tray. Well, for this cookie sheet anyway. The other one is still a work in progress. I'll share when it's finished. I'd like to do something for Christmas with that one... I'll keep you posted. The process for the tray was easy. First, I washed them very well and made sure there weren't any loose chips flaking off. Next, we (ok, my husband) sprayed the back of them with a coat of whatever white Rust-Oleum paint we had in the garage. I believe it was a gloss, which was fine for the back. No one's going to see that. I was a little pickier about the front. Turns out, we didn't have anymore paint in our stash, which worked out well. I was able to chose exactly what I wanted. I went with a very subtle cream color in a satin finish. 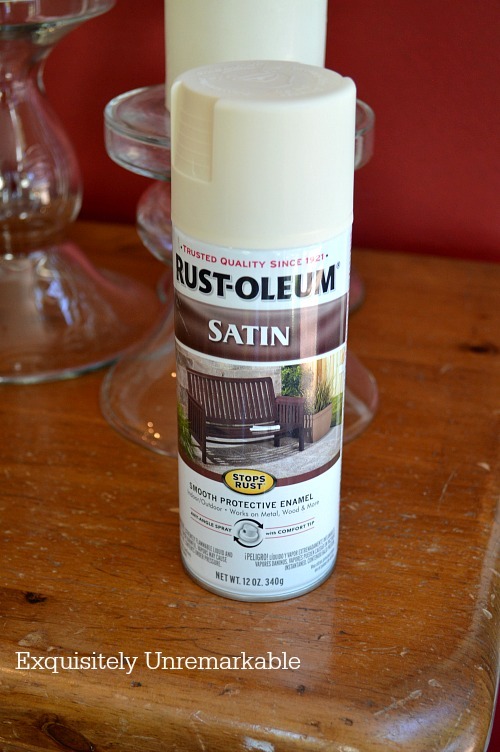 It was also Rust-Oleum. This is not a sponsored post, but I like this brand. We've painted a ton of other things with it around the house and I find it to be extremely durable, especially when it comes to metal. He gave each sheet two quick coats and left them out to dry. Once the paint had stopped smelling ~ I hate the smell of spray paint ~ I brought them inside to get crafty. 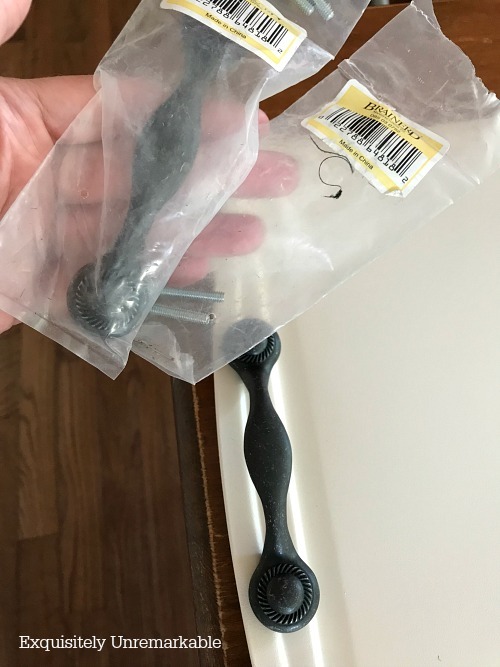 Believe it or not, tucked into a drawer in my pine server I had a pair of cabinet handles from when I was picking out hardware for the kitchen cabinets. Sixteen years ago. Oh boy. I could literally hear the words in my head from that scene in When Harry Met Sally and Harry sees his ex-wife in The Sharper Image with her new man. Harry comments that she looks like she's retaining water and when Sally says that's a terrible thing to say, he says, "No, believe me, the woman saved everything." Anyway. 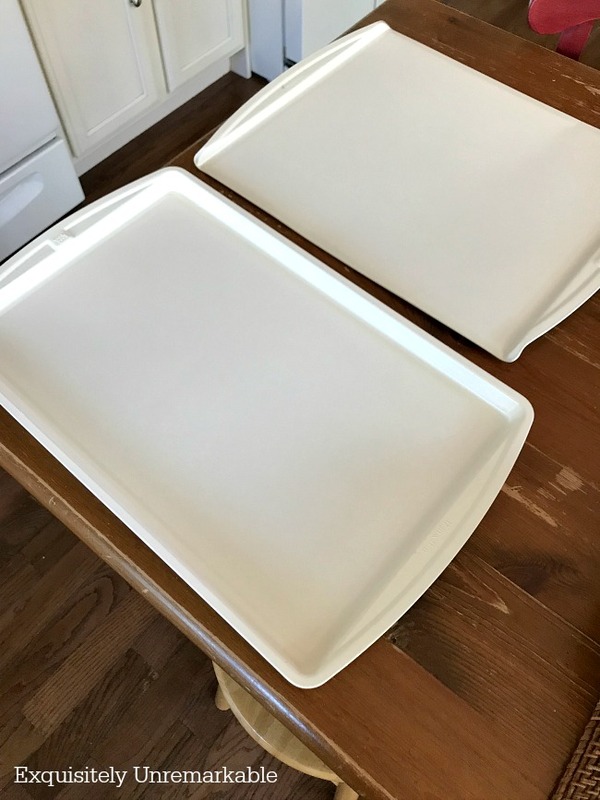 They fit perfectly on the side of the cookie sheet and the style was right. Of course, the tricky part was deciding how to get them to stay on. I've heard people rave about E-6000 glue, but I've never tried it...and while we do have epoxy and other super glues in the house, my husband felt that screws would be most secure. 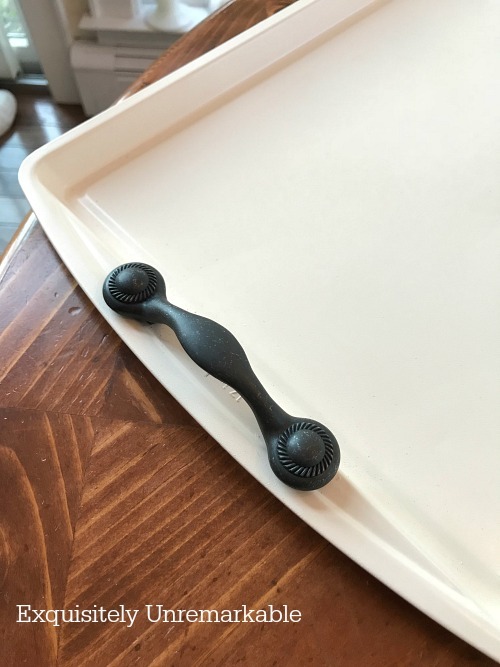 I wanted a very functional tray. That means one that I can load up with things and carry around. Glue made me nervous, I'd like to be able to carry a full pitcher of something outside without the glue on the handles giving way. So we went with screws. 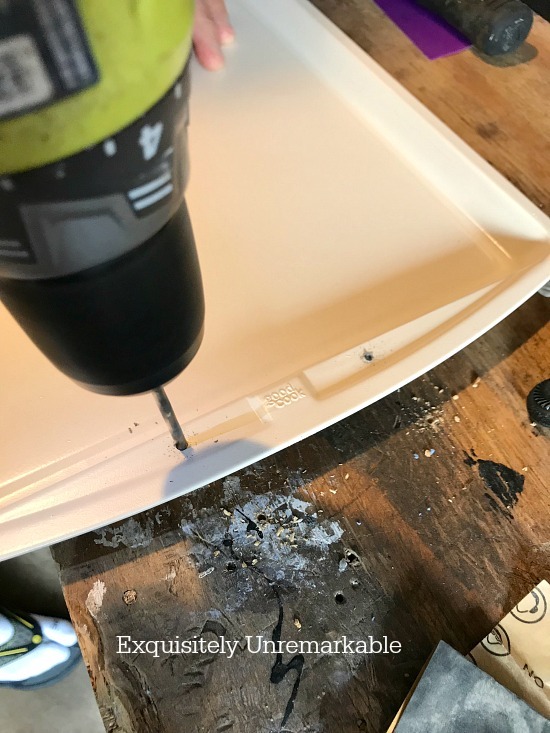 Of course, this route made it a little less of a super easy DIY than I usually like, but since he offered, I let him drill a few holes in the cookie sheet. Once the handle was on, I knew we'd made the right choice. 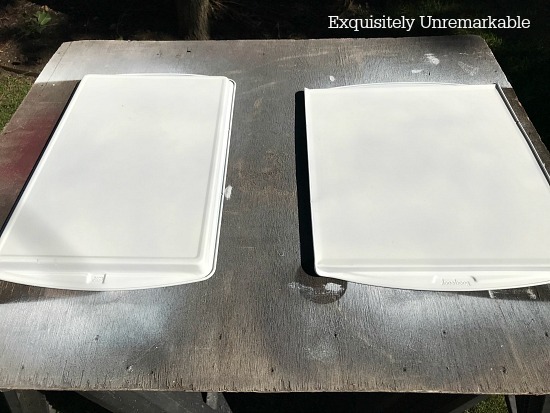 And while my original plan was to stencil a word or phrase on to the tray, once it was done, it was so clean and elegant looking, I decided to leave alone and enjoy its classic simplicity. Right now, I'm still playing with it, moving it from room to room, dressing it with different accessories, but I really can't wait to entertain and show it off. 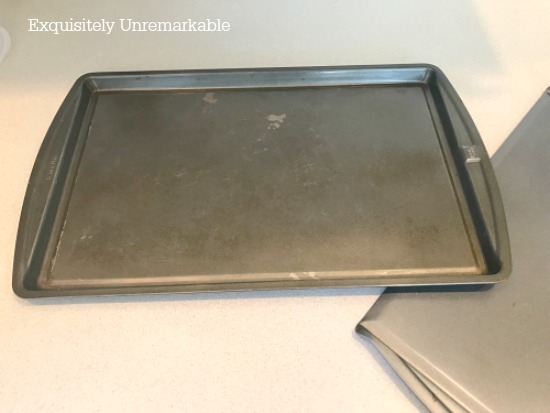 It still blows my mind that it was once an old cookie sheet. And the crazy mind workings of someone who really hates to cook. I wonder what I could do with a crock pot? Hey there...after I wrote this post I started researching tips and tricks to great decoupage. Turns out my friend Ann from The Apple Street Cottage has an awesome tutorial. You must check it out and while you're there peek at her pretty napkin projects. Hi Kim, wow the tray came out so nice. It’s great that you can come up with the ideas and your husband does the work. Lol. I bet the one for Christmas will be just as nice. I saw some white chargers with a beaded edge at Dollar Tree. They were in good shape, no scratches. I knew they would be great for something, but my mind isn’t creative enough to come up with an idea. Maybe you can. Check them out. Hmmm...I'm going to have to put my thinking cap on for sure. They sound very pretty, I'm going to have to go to Dollar Tree and take a peek! And thanks!! Adorable! Like I said with your last project, you are the queen of crafts. You need your own TV show. Yes!! HGTV would love her! Thanks Brenda! I think I’d end up like Cindy Brady frozen in the presence of that red camera light! Ha!! Hey! I happen to know where there are tons of handles! The son of a friend works at a cabinet shop, and when they were changing out ... something, he ended up with like - 100 or so! cabinet door handles and pulls. He gave them to me. Score!! I gave them to a friend, who is cleaning out stuff. Maybe I'll get lucky and he'll give back a few?? And then there is the collection of 25 cent "silver" trays I pick up at the local chartiy thrift shop, only 3 blocks from my house. Did I mention my spray paint fetish? Yep. Another thing on my "list." Thanks. I think. Nancy, your comments always make me blush and chuckle. Thank you so much...and oh boy, sounds like you have the ultimate treasure trove of goodies at your house. I would never ever have thought of this. 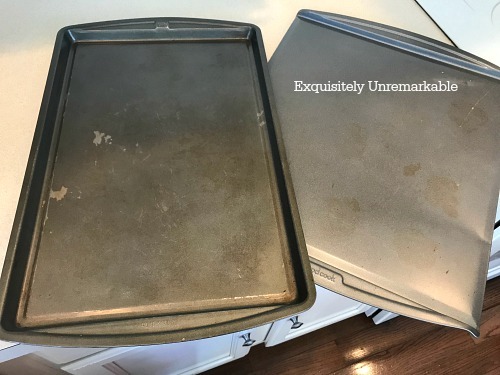 Even when I read the first of the post I could not imagine a cookie sheet, an old cookie sheet, turning out like this. Well done! It is elegant! I think you deserve dinner out now. Thanks Dewena and I’m going to show my husband your comment…one dinner out coming right up!! I love this - it turned out great! Thanks so much, Mari! I'm very happy with it. Myrna, thanks so much...and I'm glad you got a laugh. That is one of my favorite movies of all time. It makes me laugh every time. And I love your use of the cookie sheets. Super idea!! This turned out great. What a great idea. I cannot wait to see the Christmas one. Pinned - what a great idea - and very handy too. Thanks Joy! It actually is very handy. So far, so good. Diana, I bet they all come in very handy when you make all those cute gingerbread cookies!! What a great transformation! 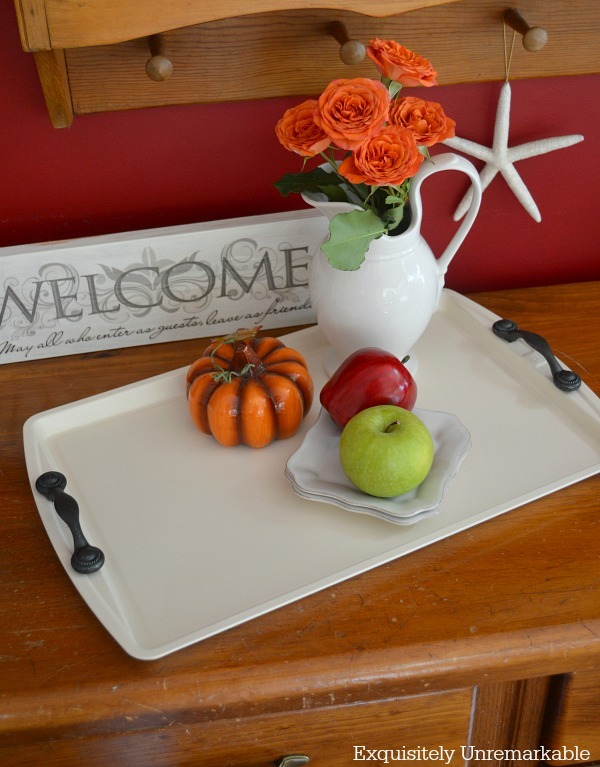 I wish I knew about this last week when I went from store to store in search of...you guessed it...a white tray! If only I was as clever as you. to quote another line from that wonderful movie. I have one of those old trays just like that & it's grody. I'm amazed at the transformation Kim! Looks great. Thanks Florence! It turned out better than expected. Who woulda thunk an old cookie sheet could look so elegant??? It turned out awesome:) I may try this since I don't use mine to bake cookies any more. I use a pizza baking stone and it is absolutely THE BEST for cookies!!!! Looking forward to seeing your Christmas project too. Thank you, Cheri and your comment is so timely! I was just looking through a Pampered Chef catalog and I was contemplating buying a stone. My husband has always wanted to make his own pizza and I said I think you can bake cookies on them, too. I may have to take a second look…thanks so much!! The power of paint... the power of imagination, more like. Well done you! You have a DIY mind . . .
Sure does create a colorful attractive fall table scene . . .
Amazing Kim . . .
Haha, Michelle, I am not a baker at all. I like it much better this way...I'd rather buy cookies! Very creative Kim. I love the finished project! Thanks Jann! It's already proved very useful. You have got to be kidding me!! Who knew? 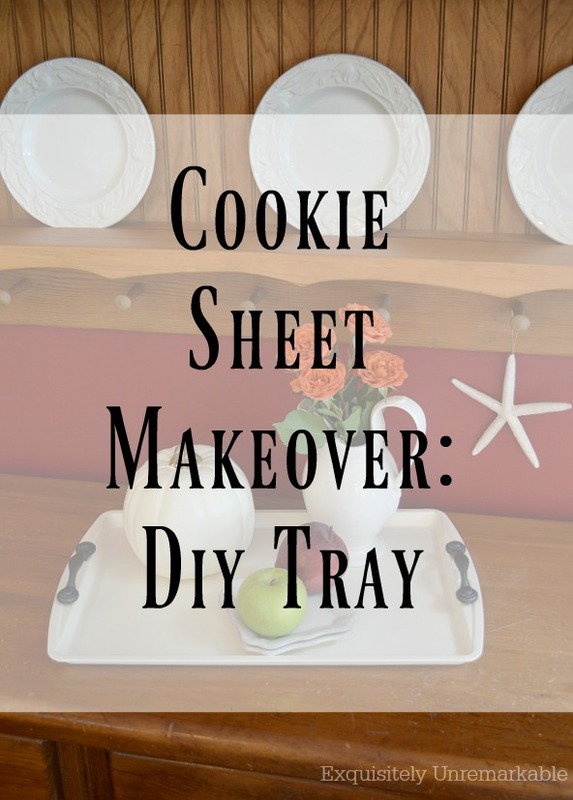 I absolutely LOVE it and I have one of those cookie sheets. ;-) Craft time ahead!! Pinning!! Now what color should I make mine? Oh Carla I’m so glad you like this one! I hope you’ll share if you make one. I’d love to see what color you choose!! Congratulations on being on the Amara Awards shortlist! J, THAT is a genius idea and can you believe that I actually have an old one...and it's red! Go figure. And thank you my friend. I need one of these in my life, it is so, so cute!